Often, I wish I could be two places at once. You can probably relate. Even here on remote Lopez Island where I live, there’s almost always more than one event happening at the same time, all year long. Add to that the opportunities to participate in literary events, support fellow writers as their books are released, celebrations, actions to save the earth, time with family and friends, and the myriad ways to help my community, I regularly feel there aren’t enough hours in the day. When any of these occasions take me from the place-based writing I’m doing, I feel especially pulled. That was the case the past two weeks, as I was “back in the saddle” to care for my son, rather than riding and writing on the interisland ferry. “Mom, could you come help out when I have my foot surgery?” Matthew asked when he learned the date for the repair of a torn tendon in his right, big toe. “Come help” meant a trip to Chicago to stay with Matthew, his wife Jenn, and their one-year-old, Maggie. “Might be nice to have someone here with a medical background,” he said. I knew I needed to dust off my nursing skills, sharpen my grandmother know-how, and travel to their place. Healing of the tendon graft requires that Matthew not bear any weight on his right foot for at least three weeks. Although he can work from home as a recruiter and trainer as well as a medical interpreter for a language-interpreting agency, this recovery plan makes caring for his one-year-old daughter especially difficult for him and his wife. Don’t get me wrong. Who wouldn’t want to spend time with this cherub? Playing and cuddling with her is always a delight, and I’m grateful that my work as a writer is so mobile. Perhaps I need to recruit little Maggie as an assistant writer-in-residence. Her parents might object, but I’m sure the crew and passengers would welcome her aboard. Chicago during the polar vortex. I’m back home now, apparently bringing the “polar vortex” I experienced in Chicago with me. Temperatures around the Salish Sea have been in the low twenties the past couple of days. 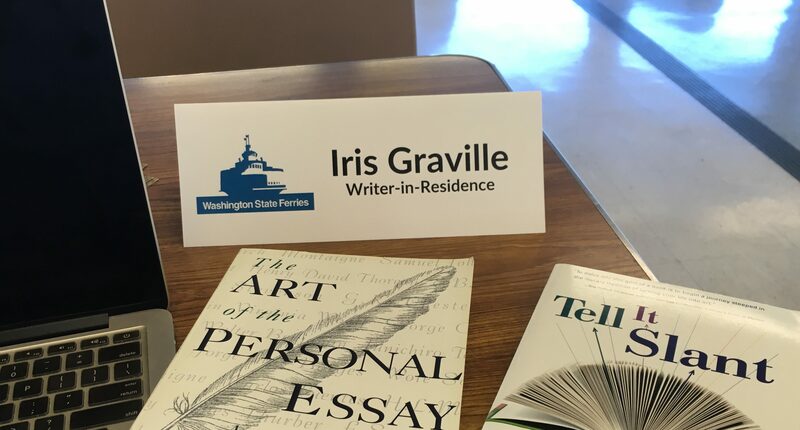 This week I hope to return to my writing spot on the MV Tillikum. Feel free to join me, and please bring some hot tea! This entry was posted in Salish Sea, writer-in-residence. Tagged grandparenting, Lopez Island, nursing, polar vortex, Salish Sea, San Juan Islands, tea, Tillikum, writer-in-residence, writing. Next Post Next post: Will She Ever Return?